Option 1: Click Devices on the dashboard. Option 2: Click My IT Environment > Devices. Device groups shared with you by other users. These device groups may be top-level groups, child groups, or lowest-level groups, in the environment of the user who shared the group with you. Second-level (child) device groups you created. Individual devices registered using the direct connect method, whose registration must be completed. Individual devices in your default device group that you have not put into a child group. Individual devices that you have put into a child group, that you have not removed from your default device group. Hover your cursor over an object to display summary information. Click a summary to view details. For a device whose registration is complete, click the device to go to its individual screen. To simplify what you see in the All devices view, you can create child device groups (see Create a device group), put devices into those child groups, then remove the devices from your default device group (using Manage device groups > Edit device groups and selecting your default device group). Then only groups, consisting of child groups and groups shared with you by other users, will appear in this view. Servers, storage systems, solutions and switches, registered for remote support using the central connect method. With central connect you register the device to communicate with HPE through an HPE Insight RS centralized Hosting Device in your local environment. ProLiant Gen8 and later servers registered for remote support using the direct connect method. This method is available using HPE iLO 4 Management Engine 1.40 or later, or Intelligent Provisioning 1.60 or later. BladeSystem c-Class enclosures registered for remote support using the direct connect method. This method is available using the Onboard Administrator (OA) 4.11 or later. To access the iLO or OA web interfaces, you must enable Transport Layer Security (TLS) in your browser. TLS is the successor to Secure Sockets Layer (SSL). A manually added device is not registered but is added by you locally within Insight Online. See Add a device manually for details. Appears in the device view as a normal device, named "Insight RS host"
A virtual machine, it is not included in counts of service events, remote support issues, cases, or contracts and warranties, and information about those features is not available. Its device type is listed as a type of virtual platform. A physical server, the device type and model of the physical server are displayed. Incomplete A device was registered using the direct connect method, and its registration must be completed. Click the device to complete its registration. Devices with incomplete registration remain in your default device group, or in default device groups shared with you by other users. Once you or the user who has shared the device group with you has completed the registration you can move the device to a child group. Orange exclamation point Device has a remote support issue. Green square with check Device has normal service event status. Red circle with X Device has a critical service event. Typically a name you entered when registering the device. Otherwise obtained automatically from the Windows “ComputerName” property, or through the AMSAgentless Management Service, which is a lightweight service that collects OS-based information and provides it to iLO. Device type/model Example: HW / HPE Next Generation ProLiant DL380 server. You can delete manually added devices entirely. You cannot delete central connect devices in Insight Online. The menu option is available but disabled. To delete such a device, use the Insight RS console. Select the device in the Device Summary tab, then select Actions > Delete selected. You can delete direct connect devices, but note that this is not a true delete or unregister; it only removes the device from the Insight Online view of devices. To delete such a device, go to the device management user interface where the device was originally registered (iLO, Intelligent Provisioning, OA) and disable or delete the device there. Delete the device from Insight Online only as a last resort, and only if the device remains in the Insight Online view even after you have disabled or deleted the device as described. See the HPE Insight Remote Support and Insight Online Setup Guide for HPE ProLiant Servers and HPE BladeSystem c-Class Enclosures for more information about deleting central connect and direct connect devices. The effect is the same as signing out and signing in again. 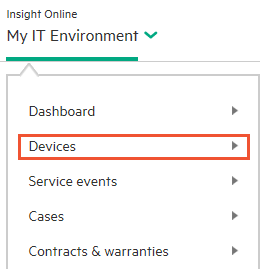 You can add devices manually in Insight Online, using Add Devices, but doing so does not register the devices for remote support. This means that you do not see service events or configuration details for those devices. However, adding devices may still be useful since it allows you to view contract or warranty details for these devices, and allows you to see all your devices, whether remotely supported or not, in one place. Devices are always associated with a contract or warranty, even if the contract or warranty has expired. Contracts and warranties associated with remote support devices are automatically linked to the HPE Passport ID registered for the device, and are visible in Insight Online. 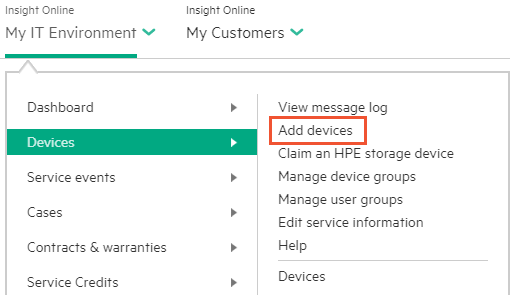 However adding a device in Insight Online manually requires that you first identify the contract or warranty that covers the device, and then link it to your HPE Passport ID. If the device you want to add is not listed in the contracts and warranties that are linked to your HPE Passport ID, you must find a contract or warranty that covers the device, add it, and link to it. See Link contracts and warranties for more information. If support coverage for a device has expired, contact your HPE Services sales representative or HPE Authorized Channel Partner to purchase continued support coverage. 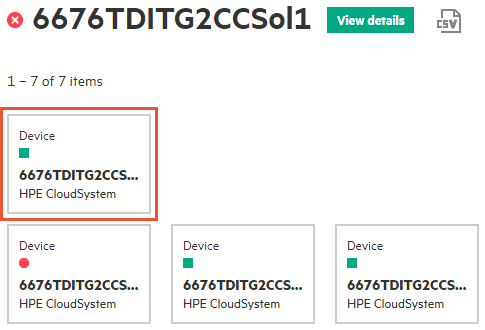 Browse to My IT Environment > Devices > Claim an HPE storage device to claim an HPE storage device. Claiming allows you to complete Insight Online remote support registration by assigning ownership of a storage device that previously had no ownership set. Unlike devices that you add manually, device status, service events, support cases, and associated contracts and warranties will be listed for devices you claim. You have three attempts to enter these values correctly before being locked out for one minute. Upon successful claiming of a device, a refresh occurs and the device will appear in your device list. You can then click on the device to review and if necessary update the partner, optimization opt in, and support contact information for the device. 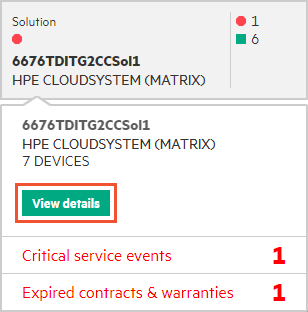 Hover your cursor over a device group to see summary information such as totals for critical service events, devices with remote support issues, cases, and expired contracts and warranties. Click a summary to view details. Click a device group to see devices and child device groups within it. first name + last name + "Devices"
Devices recognized as being associated with your HPE Passport ID, registered through either central or direct connect methods, that you have not moved into a child device group. Devices you add manually that you have not put into a child device group. Child device groups you create. Every device group is associated with a user group. You are the only user in the user group associated with your default device group, and you cannot add users to it. To give other users the administrator role, or any other role, for your default device group, create another user group or use an existing user group, assign roles to it, and associate it with your default device group. To do so, click on Manage device groups then Edit device group in the Actions drop-down list at the far right, and follow the procedure. From there you perform such functions as adding and removing devices, adding and deleting child device groups, and updating the contract and warranty status of the devices in the group. Note: If you have purchased a new contract that covers a device, or the ownership type of an existing contract associated with a device changes, use Run contract and warranty update to update the association. See Run contract and warranty update for details. This does not necessarily mean they are top-level groups in the environment of the user who shared them with you. A group shared with you could be a child (second level) or bottom (third level) group in the environment of the original user, and it will still appear at the same level as your default device group. If another user shares two or three levels of groups with you, the topmost shared group appears at the same level as your default device group. Sharing a device group does not share its child groups. Child groups must be explicitly shared to make them visible and accessible. This means that if another user shares a device group with you but not its child groups, you will not be able to see child groups under that device group, even if you are an administrator. This can cause side effects such as in device and group counts, and in a possible inability to delete a device group. If that happens contact the other administrators of the device group you are trying to delete. The administrators are listed in Manage Device groups in the Device group administrators column. Note: You can rename any device group, but you should be careful about renaming your default device group, especially in a complex environment with many users and shared device groups, because the name is the only indication that it is your default device group. Device groups let you arrange your devices into logical groupings to make managing your environment easier. Put devices that you want to manage in the same way, or that have something in common, into a group. 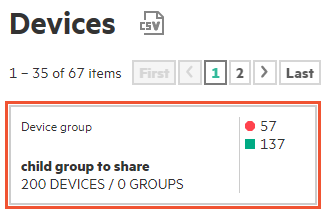 Device groups you create in Insight Online are child device groups, typically within your default device group. The default device group is created when you first sign in, and is associated with a default user group containing only yourself. You can create two levels of device groups. Your default device group can contain child device groups (second level) which can in turn contain child device groups (third and lowest level). Create second- and third-level child groups as a way to organize large numbers of devices into categories. When you create a child device group, you must associate it with at least one user group. 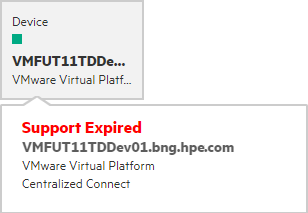 Your own HPE Passport ID is in the default user group, which is always listed, so you can add that first, and add other user groups later. In this way you can construct a meaningful set of child device groups, and add user groups to them afterwards. All devices associated with your HPE Passport ID are in your default device group to begin with. Devices must be in at least one device group, and can be in more than one device group. For example, you can create a child device group based on function, such as servers, and another child device group based on location, such as Houston, and put the same devices into both groups. You can associate each device group with a different user group. Devices that you put into a child device group remain in your default device group unless you remove them. After you put devices into child groups, you can then remove them from your default device group (using Manage device groups > Edit device groups and selecting your default device group), to simplify what you see in the top-level All devices view. 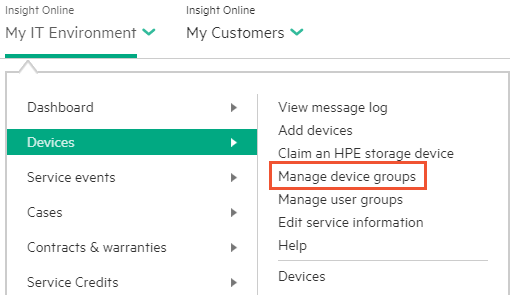 If you have more than 60 devices in a device group, HPE recommends that you move the devices into child groups. This is just a guideline, to make the management of your devices easier and improve the performance of the device page. When other users share device groups with you, you see those groups in your All devices view. Click Manage device groups in the Devices submenu. Verify the derived contracts and warranties associated with the device group. Click Next. Associate a group of users with the device group. You can create a new user group or select an existing user group. Click Next. Assign feature service roles to the members of the user group. (See Assign roles to user groups.) Click Next. Insight Online creates a derived contract and warranty share (described in Share contracts and warranties) automatically when you create a device group. When you create a device group, you must assign the roles of administrator and member to at least one associated user group. In addition to administrator and member, you assign other roles to each user group to enable feature access. See Assign roles to user groups for details. You have shared a device group with another user and that user has created a child group within that group and not shared it with you. In these scenarios you will not be able to delete the device group. You must contact the other administrators of the device group. Though you cannot see an unshared child group or know exactly who the creator is, the creator will be one of the administrators of the device group, since only an administrator could have created a child group. The email addresses of the administrators are listed in Manage Device groups in the Device group administrators column. Contact the administrators in the list to find out which of them created the child group, and ask the creator to share the child group with you or to delete it. Group name User defined. If the name is truncated, hover over the name to see the complete version. Devices in the device group with critical service event status. Devices in the device group with normal service event status. One or more of the devices in the group has a remote support issue. Hover over the device group to see the number. Device total Number of devices in the device group. A solution is a collection of devices configured together for a specific business purpose. Solutions are created and managed in Insight RS and are read-only in Insight Online. In Insight Online, solutions have characteristics of both devices and device groups. The differences can be seen in two contexts, "solution as container", and "solution as device", explained below. A solution behaves like a device group, in that it contains devices, and its details screen lists totals for the devices it contains. In Insight RS, the devices in the container are the components you add to a solution. Click a solution. The resulting screen displays the devices in the solution, similar to a device group. In addition, the device associated with the solution itself is listed first, on its own row.